It's amazing to hear about a certain food for so long, yet never allow yourself to try it. My dear friend Angie has been raving about Scotch Eggs for as long as I can remember. Told told me that she would have them all the time when she was living in Dublin as a child. As much as she spoke of them, I never tried one. In fact, we never even discussed making them together. Until our Introduction to Wine night a few months ago. She made a few scotch eggs to pair with the pinot noir. Holy Mother of Queen Elizabeth...they were delicious! I knew that these would be something I would make time and time again (now that I finally own a deep fryer). Don't worry if you do not own a deep fryer - you can absolutely use a deep casserole-type pan. The thing that amazed me was the response that I got from family and friends when I made these. I was home for Thanksgiving when I made these, so I had a plethora of family members to act as my guinea pigs. Needless to say, they all fell in love with them. In fact, my brother asked me to make more a few days later! Trust me, this is a recipe that you are going to want to have in your arsenal for years to come. Put the first 8 eggs into a pan of cold water and bring to the boil. Boil for 3 to 4 minutes, then transfer to a bowl of cold water. Once cooled, carefully peel them. Have 3 plates ready - one with a small handful of flour, one with the 2 beaten eggs and a third with the panko breadcrumbs. In the palm of one hand, flatten one of the sausage balls into an oval-shaped pattie. Put an egg in the middle of the pattie. Gently shape the meat evenly around the egg, moulding it with your hands. 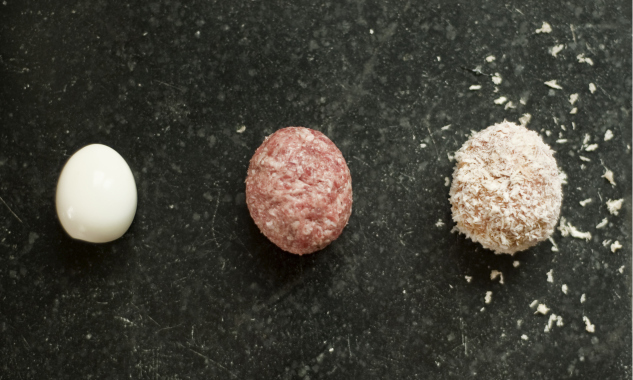 Roll the meat-wrapped egg in the flour, shake off any excess, then dip into the beaten egg, followed by the breadcrumbs. If you'd like, roll in the egg and breadcrumbs again for a really good coating. Heat the oil in a deep pan or deep fat fryer to about 150ºC/300ºF. If you have a cooking thermometer it's a good idea to use it. Carefully lower the eggs into the pan and cook for about 4 minutes, turning them every so often, until golden. Remove with a slotted spoon and drain on kitchen paper. If you're worried about the meat being under-cooked, deep-fry the scotch eggs until they're golden and crispy, then pop them in a hot oven for a couple of minutes. Cool the eggs slightly. Serve with fresh greens tossed in red wine vinegar and dijonnaise (about equal parts dijon mustard and mayonnaise).